In his fourth professional season, Brad Brimhall sometimes asked himself why he was still there, he told The Chicago Tribune. He was 23 years old and he had yet to make AA. He was also still hoping he could make it to the bigs, he told The Tribune. "You don't play minor-league baseball for love of the minor leagues," Brimhall told The Tribune. "You play for a chance at the majors, for the money, for the fame. You see guys you played with get a taste of it, and you don't want to give that up." Soon, Brimhall had to give it up. That fourth season as a pro was his last. 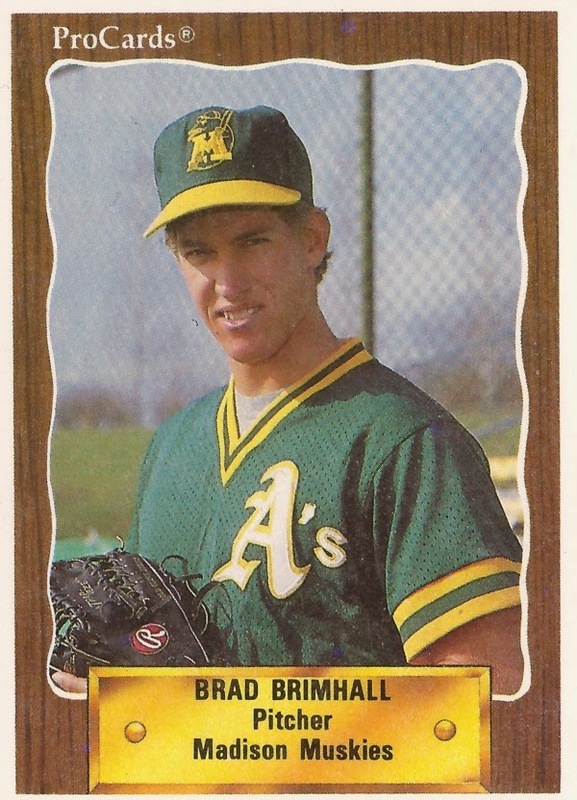 Brimhall's career began in 1989, taken by the Athletics in the 31st round of the draft out of Ricks Junior College. Brimhall went to Ricks, now Brigham Young University-Idaho, as a football player. He even had a scholarship, according to his ProCards card. But he ended up never playing a game. But he did play baseball and get drafted. With the Athletics, Brimhall started in the rookie Arizona League, getting four outings. He moved to single-A Madison and short-season Southern Oregon for 1990. Between them, he got into 27 games, starting 19. He went 2-7, with a 5.84 ERA. Brimhall returned to Madison for 1991. He went 9-7, with a 5.70 ERA. In a May game, Brimhall went 2.2 innings without giving up a run. It was his final season with the Athletics. Brimhall moved to the Orioles system for 1992. He played at single-A Kane County and high-A Frederick. It was his final year as a pro. Brimhall has gone on to be a certified strength and conditioning coach.